Have you been checking out online dating sites? Is this the reason why you’re reading this Love Crosses Borders review? Then continue reading the information provided just for you below. Interracial dating is becoming more common today, despite the increasing racism that people are experiencing today. There are still some people who are not so open-minded when it comes to people dating another race. Fortunately, interracial dating sites are here to help you find like-minded people. 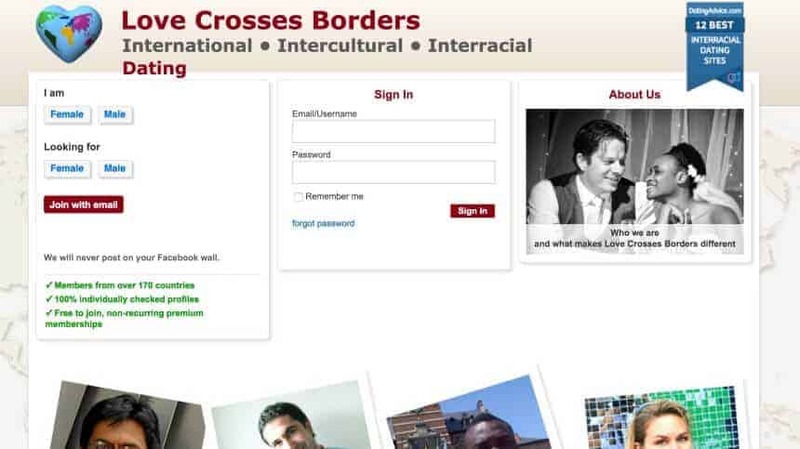 One of this interracial dating sites that I’m talking about is Love Crosses Borders. In this review, you will get to know the location and know if this is worth signing up for. Love Crosses Borders is an interracial dating site, which focuses on international friendship and dating. The site also caters to people who are looking for mixed relationships and as well as marriage. One of the best things about Love Crosses Borders is that they make it convenient and easy for users to understand and experience the site. Some features will help you communicate with other members and increase your chances of meeting someone from over 170 countries. Majority of online dating sites today are making potential members answer multiple questions before they sign up. This can be frustrating for some, especially if you are in a hurry to find someone to date. At Love Crosses Borders, they made sure to simplify the process of signing up to ensure that people will immediately get to meet members. This means that you’ll be able to start putting up your profile almost immediately. When it comes to setting up your profile page, Love Crosses Borders will let you set it up with just the necessary information. This information is typically the ones where other members are interested in. Another good thing about this is that you have the option to modify the page’s background based on your liking. You have the opportunity to choose the color or the image of your background depending on your needs. As mentioned above, Love Crosses Borders is easy to use. This may be the reason why a lot of people love this online dating site and why they are prettily rated high. Using the site will never be a problem because it’s pretty basic. This means that you won’t have a hard time finding that potential match. At Love Crosses Borders, they have this component, which is usually a container of contents. A member has the option to add more information through the mo profile section. It includes gifts, friends, maps, and as well as a photo gallery. You have the option to deactivate or add components when needed. But some components are impossible to deactivate. Lastly, you also have the opportunity to move the components and place it in a particular position on your page. As mentioned above, as a member, you have the power to customize your profile. You can add pictures, and more details if you want to. You can also actively participate in blogging, so you don’t have to worry about anything at all. If you are a premium member, then there are some additional features for you, like sharing photographs and messages privately. Love Crosses Borders has a quick search tool that will help find the right profile for you based on the parameters that you have set. You have the option to start searching for members based on their location, and gender. The site can give you the nearest match based on the parameters selected. As you know, the easiest way to start dating is to find a potential member who has the same interest as you. Registering to Love Crosses Borders is free of charge, but if you want to enjoy more features, then it would be best to get a paid members. The reason behind this is because this feature will help unlock all of the advanced features available. As a paid member, you can privately send and as well as receive messages. Your exposure will also help you interact with the right dates so you can check out if the two of you are compatible. What’s right about a premium membership is that you no longer have to worry about ads popping anywhere. You also have an unlimited messaging option so you can talk to your potential match anytime you want. If you are serious about interracial dating, then getting the paid membership would be best. One of the most common questions that people want to know when it comes to an online dating site is if there are apps available for them to download. Unfortunately, Love Crosses Borders doesn’t have an app. But you can use the browser on your iPhone or any smartphone to use the site since this dating site is made to work in mobile phone’s browsers. Of course, just like anything else, there are also pros and cons of joining Love Crosses Borders. No website is too perfect not to have any disadvantages and such. Features can’t be seen without registering first. Love Crosses Borders has a potential of helping you find a match. You can try this site for free since they will only charge you when you subscribe to their paid membership. But with all these said, it would be best to try out other interracial sites which are well established enough. But if you want to give Love Crosses Borders a chance, then, by all means, hit that sign up button!